Home > Used Vehicles > 2013 Lexus RX 350 BASE,AWD,LEATHER,SUNROOF,AIR,TILT,CRUISE,PW,PL,SUMMERS AND WINTER TIRES,LOCAL TRADE,CLEAN CARPROOF!!!! 2013 Lexus RX 350 BASE,AWD,LEATHER,SUNROOF,AIR,TILT,CRUISE,PW,PL,SUMMERS AND WINTER TIRES,LOCAL TRADE,CLEAN CARPROOF!!!! Hurry on this one! Marked down from $24900 - you save $1000. 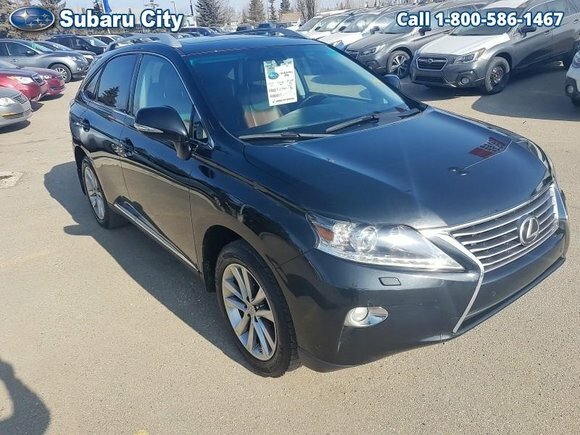 This 2013 Lexus RX 350 is fresh on our lot in Edmonton. The Lexus RX 350 gets revised styling for 2013. The interior receives a few design and functionality enhancements while the standard equipment list expands. The 2013 Lexus RX 350 leads in its segment with good fuel economy, generous cargo space, and an elegant interior. This SUV has 135345 kms. It's starlight black mica in colour. It has an automatic transmission and is powered by a 3.5L V6 24V MPFI DOHC engine. Buy this vehicle now for the lowest bi-weekly payment of $207.90 with $2593 down for 60 months @ 5.99% APR O.A.C. ( taxes included, $790 Administration and Secure Ride included / Total cost of borrowing $3695 ). See dealer for details. Want to try the 2013 Lexus RX 350 BASE?